So what to drink when the sun is shining? There are plenty of white wines that come to mind straight away but what about red?! Most people associate red with being a bit more of a winter drink and certainly not something to quench a thirst when the temperature outside gets hotter. 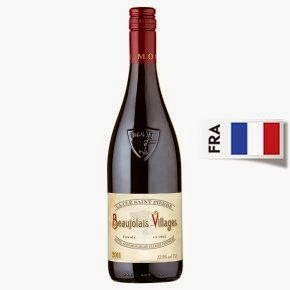 However, there is one type of red wine in particular that is perfect for a hot summers day - Beaujolais. They are beautifully crisp and refreshing and when stuck in the fridge for a good 30 minutes before serving, and are absolutely perfect for drinking in the garden - especially with some smoky sausages on the BBQ. Beaujolais Villages is always a good wine to seek out if you want to get familiar with this region, and something like La Clé Saint Pierre Beaujolais Villages from Waitrose is a great one to go for as a starting point. It's bursting with ripe cherry and summer fruit flavours, and at £8.99 it represents great value for money, so if you are looking for something a little different to Pimms in the sun then get out and grab yourself a bottle!